Below you can view all the homes for sale in the Wash Park subdivision located in Denver Colorado. Listings in Wash Park are updated daily from data we receive from the Denver multiple listing service. To learn more about any of these homes or to receive custom notifications when a new property is listed for sale in Wash Park, give us a call at 720-729-2320. Convenient to Downtown. Desirable and popular urban neighborhood. MLS#5307465. RE/MAX ALLIANCE. Commuting is a breeze with the light rail station only a short walk away and with very quick access to I-25. MLS#6278885. Redfin Corporation. If you're looking for an exceptional location, a massive amount of living space and the minimal HOA that comes with owning a townhome, then you have found THE ONE! MLS#4931608. Thrive Real Estate Group. There is a huge sale this weekend, Friday and Saturday from 10 a.m. until 6 p.m. MLS#8576157. Redhead Luxury Properties. 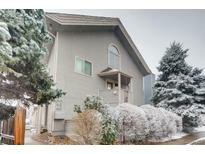 Close to Denver, DTC, adjacent to Wash Park and easy access to highways. This home has it all! MLS#6890405. RE/MAX Leaders. This luxurious urban gem is located in the Washington Park & South Broadway area***Back yard for your BBQ off the main floor kitchen & a Skyloft for fabulous entertaining with unobstructed views of the city and mountains*Love the wall of 2-story South facing windows, High-end Kitchen-aid appliances & wide plank site finished wood flooring throughout the main floor*Plenty of space for full size Dining & Great Room*Home offers a Mezzanine level which is perfect for you to work "remote" or use as gaming area*Display beloved art pieces or your book collection, too*Upstairs offers 2 spacious bedrooms & 2 full baths with wide format tile and over-sized shower*Detached 2 car garage provides tons of extra space for your weekend gear*Close to shopping, urban eateries, pubs, salons, Washington Park & Cherry Creek*Walk to some of the best restaurants, get a massage nearby, or take your best friend on a walk around Wash Park*Builder nominated for prestigious "Mame Award" for design 2017/2018. MLS#5348176. Coldwell Banker Residential 26. This luxurious urban gem is located in the Washington Park & South Broadway area***Back yard for your BBQ off the main floor kitchen & a Skyloft for fabulous entertaining with unobstructed views of the city and mountains*Love the wall of 2-story South facing windows, High-end Kitchen-aid appliances & wide plank site finished wood flooring throughout the main floor*Plenty of space for full size Dining & Great Room*Home offers a Mezzanine level which is perfect for you to work "remote" or use as gaming area*Display beloved art pieces or your book collection, too*Upstairs offers 2 spacious bedrooms & 2 full baths with wide format tile and over-sized shower*Detached 2 car garage provides tons of extra space for your weekend gear*Close to shopping, urban eateries, pubs, salons, Washington Park & Cherry Creek*Walk to some of the best restaurants, get a massage nearby, or take your best friend on a walk around Wash Park*Builder nominated for prestigious "Mame Award" for design 2017/2018. MLS#7407505. Coldwell Banker Residential 26. This is a great opportunity to enjoy urban living at its best! MLS#5655127. GREEN DOOR LIVING REAL ESTATE. This home is located 1/2 mile from Wash Park and the light rail station, and 2 miles to restaurants and shops on Old South Gaylord Street. Welcome home! MLS#7620068. RE/MAX PROFESSIONALS. Compare this house to anything in the price range and you will not be disappointed! MLS#7634726. Thrive Real Estate Group. Nice mud room on main level. 2 car detached garage. MLS#6856914. Devex Realty, LLC. This home is perfectly situated close to Wash Park, restaurants on Broadway and easy access to Downtown and Cherry Creek North. MLS#5255390. Camber Realty, LTD. Owner occupied residents may have pets with HOA Board pre-approval. MLS#3615557. Edelweiss Realty. A new sewer line and 1" water tap have been installed, but are not in service. MLS#7815562. The Seneca Group. Buyer to verify schools and taxes. MLS#2618555. Kentwood Real Estate City Properties.